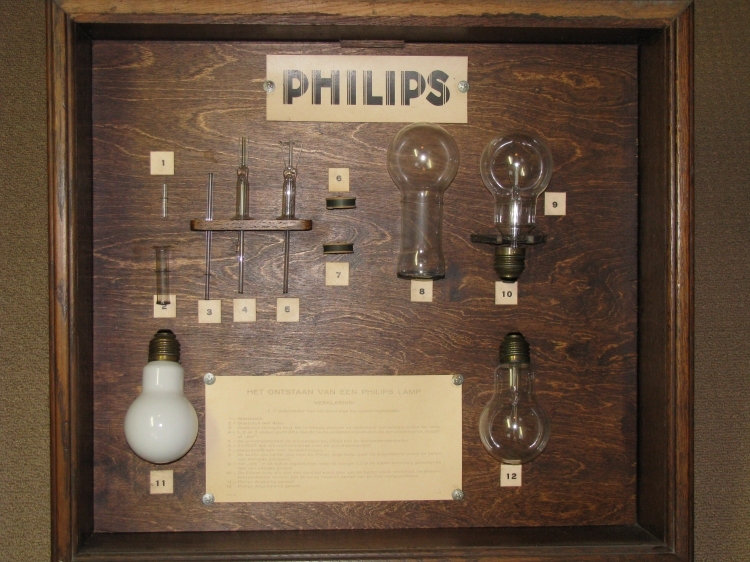 Cabinet containing all steps of the production of a Philips Arga and Argenta lamp. 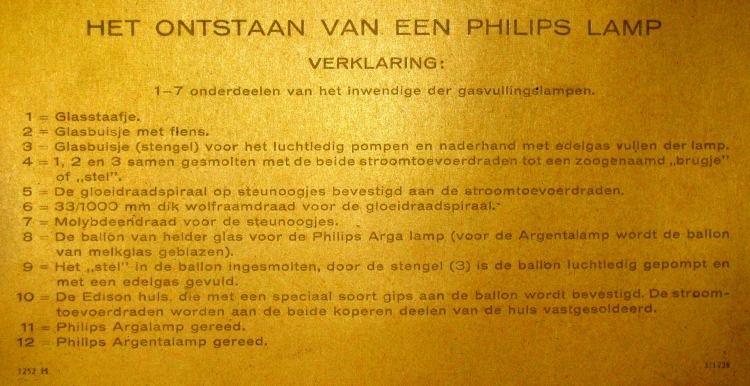 Kastje met daarin alle fasen van de productie van een Philips Arga en Argenta lamp. 3 = Glass tube (stalk) for pumping vacuum and filling the lamp with Argon gas. 4 = 1 , 2 and 3 melted together with the two power wires to a so called "bridge" or "set"
5 = The fillament on support eys connected to the power wires. 6 = 0.033 mm thick Wolfram wire used for the fillament. 7 = molybdenum wire used for the support eys. 8 = The bulb made of clear glass for the Philips Arga lamp (for the Argenta lamp the bulb is made of white glass. 9 = The "bridge" melted in the bulb, Throug the stalk (3) the lamp is pumped vacuum and filled with Argon gas. 10 = The Edison socket mounted to the bulb with a special kind of plaster. The power wires are soldered to the both copper parts of the socket. 11 = Philips Arga lamp ready for use. 12 = Philips Argenta lamp ready for use.